2 Kevin L'Heureux Santa Clarita, CA (USA) Installed the board this morning and everything is AOK! I definitely like how you slowed the patterns down and extended them. Overall I think the light show is very nice and I am pleased. I really like the red led's but the more I thought about it, it may be because they contrast with the green domes on the ships so maybe the green led's would look better to me if they were used with ships with red domes. Just a thought. let me know if you have any more questions, i'm glad to help. 3 Tim Stephens San Jose, CA (USA) Bill, I know I already emailed you, but I wanted to tell you again how happy I am with my RFM saucer kit. AWESOME! 8 John Arriola Scotts Valley, CA (USA) I received the RFM-LED kit today and installed it in about 20 minutes. Cool addition to the game, looks like it belongs! Thanks for your efforts bringing this to us pinheads. I recommend this mod to any serious RFM owner. 10 James Larson Pfafftown, NC (USA) All is functioning as designed, no problemos. Looks great! Thanx! 14 Al Flack Rapid City, SD (USA) Kit went in awesome, one small problem but Bill answered emails quick & the problem was resolved fast. The saucer kit is the best(& easiest) mod I have ever installed. Made my RFM a "brighter" game to play! Can't wait to get the AFM kit installed! 15 Michael Reul Maple Grove, MN (USA) Just wanted to let you know that I have installed my kit and think it looks great. 18 Jesse Balcer Indianapolis, IN (USA) Thanks again, we all love the upgrade..........seems like it should have been there all along.......that's when you know that you have made a good mod! 19 Ken Schumm Banks, OR (USA) I installed Bill Ung's RFM saucer light kit and must say it definitely adds to the game. It's very cool! RFM already has great light shows and Bill's kit makes 'em even better. The kit was easy to install, with good instructions, and it fits well into existing cable harness routing. Highly recommended for anyone considering it. 24 Stephen Cousineau York, ME (USA) I'm glad to report that my kit went in very easily and have had no (electrical) problems to date. The pin has been used extensively for about a week now. I did have an issue that the led's were quite loose in the holes and I did need some adhesive to secure them. 34 Chris Mckinley Quakertown, PA (USA) What a wonderful piece of engineering!!!! 35 Jerry Thompson Auburn, WA (USA) Thank you for the excellent kits! 42 Albert Thomka Mc Keesport, PA (USA) Got my RFM saucer light kit yesterday, and just HAD to come home early today to install it. Man, all I can say is that when I see a RFM without the kit now, it's going to look naked for sure! I can only IMAGINE how nice the AFM kit must make that game look since there are six saucers on that came as compared to only two. For anyone waiting to get their kits, the wait is WELL worth it! DON'T WAIT ANY LONGER! Get your kit too! 43 Gregory Deakin Sterling Heights, MI (USA) Just finished installing the led kit (red) that Bill Ung sells and boy does it give the game a nice look. Bill is a class act and sells a great product right down to providing a needed "fix", easy to follow instructions and return postage. Thanks Bill ! 45 Ken FitzHenry Round Lake, IL (USA) Your kit is very well thought out. It was very easy to install. 50 Scott Zerby Shorewood, MN (USA) The kit is installed and looks fantastic! 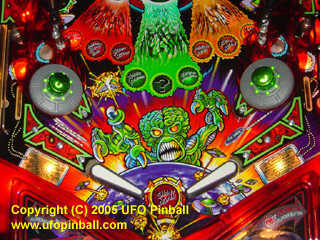 Thanks for doing this for us pinball fans. 69 Adam Savoroski La Mesa, CA (USA) Bill, I just installed my RFM light kit. I bought it about 5 weeks ago. First let me say that I was impressed with the quality of the kit. Very well done. And after installing it I am not disappointed. Fantastic. Easy to install and adds so much to the game. Thanks very much. 71 Christopher Senior Gibsonia, PA (USA) I finally got my machine to where it lights up. The first thing out of my wife's mouth was "I like the spinning lights on the saucers". I did not even tell her I installed them. I can't say enough good things about the kit, so to sum it up... Excellent product!!! 72 Mike Limberg Leverkusen, Germany I Installed my kit and everything works great. Super design and quality. I love the RFM upgrade Kit it looks realy cool :-) Thanks Bill ! 75 Bernie Rudd Cincinnati, OH (USA) Got the package and have both installed, everything looks and works great! I think the games are happy. In my first game after installation on AFM I ruled the universe twice. While I can rule on a regular basis, Ive only managed it twice in one game a couple of times (have had the game for about 6 years, took 2 years or so to rule the first time, and never ruled twice until the past year, Im definitely improving my playing ability over time). 83 Mike Beyer Richmond, VA (USA) Got it installed last night. looks great. I'm not sure who likes it more - me or my 4 year old son. Thanks. 85 Richard Sullivan Sinking Spring, PA (USA) Bill clearly did a great job engineering and designing this mod. I was very impressed with all aspects of his work. In addition, great communications and support to provide a clean installation. Most importantly, the mod really adds to the game while looking like it should have been there from the day the machine was built. Great job Bill! 86 Luc Van Esch Zonhoven, Limburg (Belgium) Amazing ... your MOD's ROCK. My AFM has always been the most favorite of my 85 machines, your mini-saucer kit's are SoCool. The circuitboards are really professional, the wiring clean perfect and the tools included great. This is the best, most effective and affordable mod i have ever installed. It is even more eyecatchy than the red neon in my TAFG. Looking forward some more BillModding...returning back to battle. 94 John Bystrek Paoli, PA (USA) Bill, I installed the RFM kit, looks awesome. All I need now is a AFM so I can install your kit for that one also. 102 Scott Fitzpatrick Gembrook Victoria (Australia) I received my kit yesterday, and I fitted my kit yesterday. They look very cool!!! Instructions are very clear & easy to install, even for someone who is a bit of a mono-cell when it comes to electronics. Thankyou...Guys like you are an asset to the pin community! 114 Kenneth Fleck Cedarburg, WI (USA) Bill - Your light modification to my Revenge From Mars is excellent in every way. I had no problem following your installation directions and the modification really makes the machine come to life! Its hard to imagine the pin never having those saucers lit up. Thanks for the creative addition that makes an already great pin even better. 116 Scott Torpe Crystal Lake, IL (USA) I want to congratulate you again on an excellent implementation of your mod. 121 Matthew Brinster Norfolk, VA (USA) Bill, I got the kit. Looks impressive. I'm going to install it later today. Thanks for the extras. I've got Spiderman and was wishing I had the flyer. Now I do! Thanks again. 122 Mark Combs Cincinnati, OH (USA) Just wanted to thank you for the RFM kit. I installed it last week and it looks and works great! You did a nice job with the wiring also and it made the installation easy. 130 Spencer Carey Winter Park, FL (USA) Bill, got the kit the other day, thanks again! 142 Control Your Home, Inc. Muskegon, MI (USA) Highly recommended! SO well integrated with the game software. I was amazed at the amount of work that Bill must have done to make this function like it should have been there, and install easily too! PCI card, plug and play cables, and the rest were easy to install. The LED's take a bit of time to get straight, but once in, they stay there. Absolutely no regrets getting this mod. 167 Vincent Stevens Roen (France) Easy install and perfect part. Manufacturing is professional. The Look now is very nice; Thank very much ! 174 Edd Cramer Brooklyn, NY (USA) Yes if you own a RFM you should not even think about weather or not you should add this mod. The addition of Bill Ungs Mod brings your playfield to life as never before. The kit is complete, well made and easy to install and dare I say one of the best Plug and Play Pinball visual Mods out there. 204 Julien Greening New South Wales (Australia) I just wanted you to know I got your kit and installed it into my RFM, it works great, great job thanks. 213 Jared Goike Standish, MI (USA) Thanks for the RFM Mod, it installed easily and looks fantastic!!! 234 Brian Hawkins Attleboro Falls, MA (USA) Just got around to installing your kit. You did a great job putting everything together and making easy to follow directions. I did have a problem with some of the LED's on one saucer. After some debugging I narrowed the problem down to the #2 cable from the computer box to the playfield coupler. Nothing looked obviously wrong but I recrimped the end and it now works fine. If you decide to put together a martian LED eyes kit for it let me know. 242 Michael Fisher Boronia Victoria (Australia) Just wanted to thank you for the RFM Led Mod. It took less than an hour to install (I removed the playfield entirely is at made it much easier for me) and everything worked first time. It looks fantastic and I was extremely impressed by the quality of the product and the design itself. 245 Dwight Bonney Canberra (Australia) I've played RFM so much lately, I feel guilty :) . I just love watching the LED lights between shots. 260 Walt Feeger Rapid City, SD (USA) I have installed the kit and it works great - really adds a lot to the game. Thanks again! 264 Bj�rn Gammelgaard Grindsted (Denmark) I must say that the LED-kit is a high quality product based on excellent engineering, and makes it a SUPER GREAT upgrade for the RFM machine! It is an absolute delight to watch the LED saucers doing their show during shots, and the way that the LED�s interacts with the gameplay (flashes at the last ramp shot and turns off during Hypno Beam) is absolutely fantastic, and makes gameplay very rewarding indeed!! 269 Ken & Rhonda McIntosh La Mesa, CA (USA) We received the kit this AM and installed it this afternoon. It works great & was easy to install. Thank-you for your innovation for this game. We saw you and your product last year at California Extreme. Will look for you this year. 281 Aaron Van Patten Melrose Park, IL (USA) Thanks for letting me know and all your help with my questions. I am very happy with the AFM and RFM kits, they look amazing and are by far the best mods I have ever added to a game. Everyone that has seen them in my games really likes them.